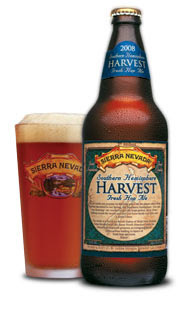 I liked the Glacier Harvest, so I'm going to keep an eye out for this one. I had another fresh hop beer at the American Craft Beer Fest (no idea which beer it was) and it was similarly flavored. Man You are definately are NOT a Hop Head! Otherwise you would appreciate the time this world class brewery took to ship these precious New Zealand Hops all the way to Chico, CA. and brew with them Fresh. This is a great beer for the Fresh Hop Lovers, but it's not for everyone. Some must stay with what they know plain and simple beers. It definately doesn't taste like a Arugala,it's more like sucking on a fresh hop mmmmm.....good!!!! I think my track record on the site would show that I actually prefer the strongly hopped beers, in fact if you were to look at the IPAs I have reviewed they are consistently rated the highest amongst all the beers on the site. Just because I don't like this one, doesn't mean I don't like the rest. Of course I may be off my rocker, after all I am responding to a mythic beast of the Pacific Northwest. Not to join Bigfoot in bashing on Beer Crusade, but I had this beer a couple of nights ago, and it was great! My expectations were very low, given the abysmal review. But I was surprised that it was full of unique hop flavors that you don't usually experience in a dry-hopped beer. In fact, I might go back and get more. I believe that you had this one on tap. I had a bottle (24 oz), which might help to explain the difference. It was $3.99 for the 24oz bottle. Definitely worth it! Wow, stabbed in the back by the Kinght of Saint Arnold. Not cool, dude, not cool. I had this beer over the weekend and love it. It is well balanced with fantastic hop flavors. Kudos to SNB for a job well done!